- Delicate geometric design, suitable for housedecoration, even the wedding decoration. - Ideal gift for Housewarming,Birthday, Valentine's Day, Mother's Day and Christmas's Day. - Give this planter set as a sweetgift to a friend with a green thumb! - We will offer the best solution. ☀CREATIVE CERAMIC NOTES SIGNS-Width 2.16 Inch, Height 4.72 Inch Perfectly displays live potted plants, flowers, small cactus and succulents. *Plants not included*. 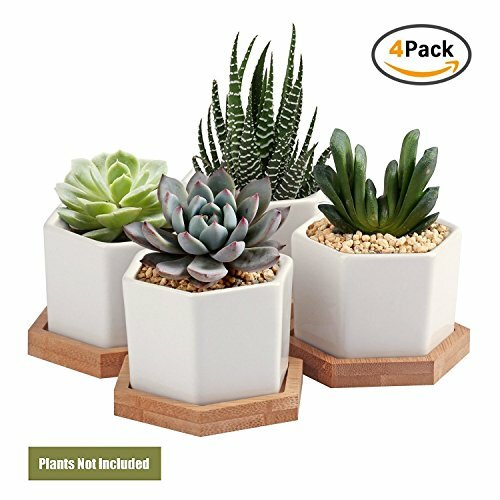 ☀BEAUTIFUL, STYLISH MINI SUCCULENT POTS-Set of 4 White Ceramic plant pots, features a drainage hole and bamboo tray at the bottom for proper draining of live plants. ☀MODERN MINIMALIST DESIGN-Great for home decor, its clean lines are greatly suitable for decorating your windowsill, desktop, kitchen, bathroom, office and bedroom. ☀GIFT CHOICE-Mini and exquisite plant pots, suitable for Housewarming gift, Mother's Day, Christmas's Day and wedding gift. If you have any questions about this product by OAMCEG, contact us by completing and submitting the form below. If you are looking for a specif part number, please include it with your message.